Experience and cunning overwhelmed youth and bravado two weeks ago as a team of alumni all-stars dominated Reed students 17-8 in an epic alumni-student Ultimate Frisbee game. The upper soccer field outside the Naito-Sullivan dorms was spattered with a decade's worth of uniforms as lanky students in red huddled in one end zone to gather courage against the talent-laden alumni in black. Student team captains Sam May ’13, Daniel Dashevsky ’13, and Xander Harris ’16 rallied their players with jokes about alumni beer bellies. Alumni heavy hitters Bryson Uhrig-Fox ’10, Andrew Lynch ’12, and Shane Rubenfeld ’06 (who coaches the student team when he’s not playing against them) traded quips about the sleep-deprived students. Play was light-hearted but impassioned with gratuitous overhead throws that seldom found their target and full-body dives more often seen in the swimming pool. Alumni scored early and often with easy cross-field swings and short-range dishes between experienced handlers and deep cuts by Lynch and the formidable Wendell Britt ’13. The youthful students, despite a sideways dive by Harris and a lofty jump by Kai Nalipinkski ’15 over Lynch, could not shut down the smart plays and long throws of the alumni. 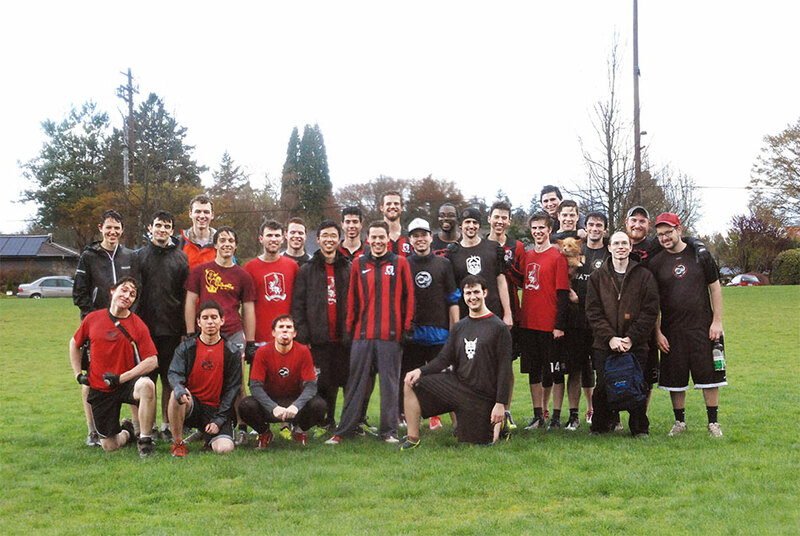 Alumni took half with an aerobatic Lynch catching the disc under the leg mid-air. Fake fouls littered the game but added to the festival atmosphere. Rubenfeld’s shouts of facetious fouls in order to extend play were met with hearty chuckles instead of derision. The sidelines threw raucous jeers about mismatched defense and the old frisbee staple to catch with “two-hands” after a fumbled disc. With two weeks before the student team was scheduled to compete in the college D-III sectionals in Parkland, Washington, the students’ thoughts transferred from theses and problem sets to building the team’s focus and morale. Beyond the score of the game, the team strove to magnify the camraderie that carried them to Ultimate D-III nationals two years ago. When asked about their favorite game at Reed, students and alumni overwhelmingly cited their win against archrival Lewis & Clark College in Parkland, Washington, for the 2012 D-III sectionals, which earned the Reed team a berth in the nationals tournament. As the game wound down and the ubiquitous Portland rain soaked the field, the alumni belted a chorus of “Can You Feel the Love Tonight?” from the Lion King, while running down the field toward New Reed. Then the alumni dropped the slippery disc, provoking a swarm of heckles from the students. After the game, the two teams huddled under the trees. Muddy, drenched, and humbled, Reedies could indeed feel the love that spring night.